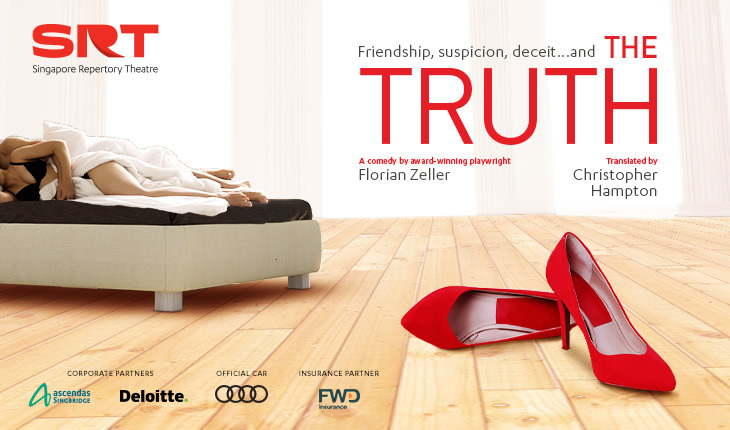 Focusing on a man caught up in a tangled love affair, Florian Zeller’s The Truth is a hard-hitting examination of friendship, suspicion and deceit. In a new version by Christopher Hampton (Les Liaisons Dangereuses), who also delivered new versions of The Father and The Mother, The Truth is a biting new play that discovers what happens when the truth is finally uncovered. Alice and Michel are having an affair. Michel’s wife, Laurence has been asking him difficult questions. Alice’s husband, Paul, is Michel’s best friend. As deceits intertwine, the two couples find themselves lost in a maze of who-told-who-what, where each loving lie seems more necessary and each confession more indiscreet. A brilliantly cruel comedy of the hypocrisies which hold society together, Florian Zeller’s The Truth, premiered at the Menier Chocolate Factory, London, in 2016, in association with Theatre Royal Bath Productions. The Truth is “a devious must-see” (The Guardian) you do not want to miss.